Although his career was cut short by tragedy, Thurman Munson's years with the New York Yankees made him one of the best catchers of the 1970s and an all-time fan favorite. His untimely death also cut short his hobby career, meaning collectors must focus on the earliest Thurman Munson baseball cards. Munson spent 11 seasons with the Yankees and his impact as team leader on the franchise was remarkable. Perhaps most indicative of this, he became the first Yankee player since Lou Gehrig to be officially recognized as team captain. Bursting onto the scene as the 1970 American League Rookie of the Year, he would add a Most Valuable Player award in 1976, becoming the only Yankee player to ever win both. He also led the team to three consecutive World Series appearances, winning back-to-back titles in 1977 and 1978. 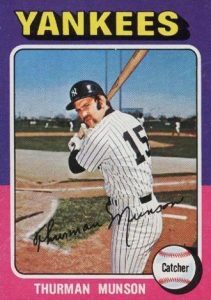 Shop for Graded Thurman Munson Baseball Cards on eBay. 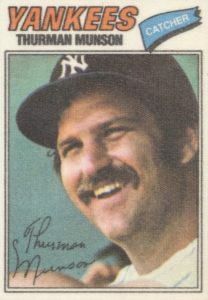 As he was tragically killed in a plane crash during the 1979 season, the final flagship Thurman Munson card can be found in 1979 Topps. 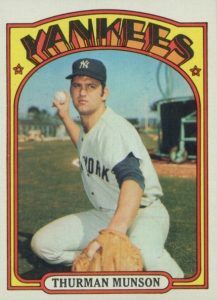 The very last card of his career came in a 1979 New York Yankees team set issued by Burger King. Those team set cards used the same '79 design but with different numbering on the reverse. Among the other cards of note, 1977-1979 Sportscasters features an amazing photograph of a play at the plate between Munson and Boston Red Sox outfielder Bernie Carbo. Collectors looking for Thurman Munson autographs cards will have to investigate cut signatures. 2011 SP Legendary Cuts features several examples while 2005 UD Ultimate Signature Edition has a dual cut autograph featuring Derek Jeter and Munson. This is one of the ultimate cards for Yankees fans. 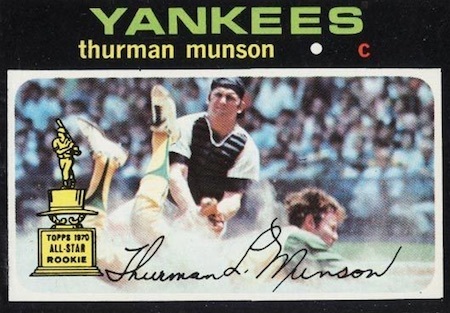 Thurman Munson cards and memorabilia remain very popular with collectors and his 1971 Topps card can command some of the highest prices amongst all cards produced during the decade. In constructing his list, card value was the key factor, along with graphic design and card availability on the secondary market. What 1971 Topps Greatest Moments gains in card value, it loses in card availability as it is one of the hardest sets to find from the modern era of collecting. Munson was featured as card #1 in the 55-card set that shares the black-border design of 1971 Topps. The cards are oversized at 2-1/2" by 4-3/4" and it is thought that these cards were only available in the New York area, making Munson's card all the more popular. Already rare in any grade, gem-mint copies are essentially impossible to find as most examples are mis-cut. The 1975 Hostess set was the first one issued by the dessert maker in what would be a yearly tradition for five years in the late 1970s. Cards were included in panels of three on the bottom of Hostess boxes and a premium is placed on panels that have remained intact through the years. Munson shares panel #46 with Chicago White Sox outfielder Ken Henderson and Philadelphia Phillies infielder Willie Montanez. The card backs feature partial career statistics and biographical information. Issued as a test run to gauge interest, the cards in 1975 Topps Mini are 20% smaller than the regular 1975 Topps cards. Based on how popular the mini cards remain today, it is hard to understand why Topps didn't continue to issue these pint-sized, flagship versions. To celebrate the 40th anniversary of 1975 Topps Mini, Topps issued a mini factory set for 2015 Topps Series 1 and Series 2. In addition, the set included inserts done in the '75 design, honoring modern stars like Kris Bryant and Mike Trout. There were 55 players (and 18 puzzle pieces) included in the 1977 Topps Cloth Stickers set that featured the '77 Topps images on the front of the card. The reverse included brief career highlights and instructions on how to remove the paper backing from the sticker which allowed collectors to place them on just about any surface. Fans can collect four versions of Munson's 1977 card including the Topps flagship version, the Canadian O-Pee-Chee, the cloth sticker, and a Burger King Yankees team set card. The Topps flagship version is the only one that includes a red banner at the bottom that reads "A.L. All-Stars" to honor one of his seven career All-Star appearances. The last Topps card to showcase a clean-shaven Munson comes in 1972 Topps. Along with the flagship base, Munson is also featured on an In Action subset which shows him having a chat with Yankees pitcher Fritz Peterson. Oddly, the reverse side of those In Action cards don't correspond with the photo on the front as his discusses Phillies infielder Terry Harmon's record of 18 fielding chances in a game during the 1971 season. 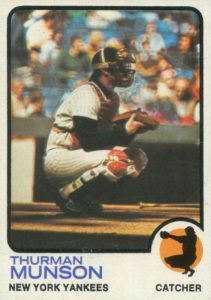 One of Munson's most iconic poses can be found on his 1978 Topps card. He stands at home plate holding his catcher's mask with a backwards Yankees cap and a big bushy mustache. Part of Munson's appeal to fans was the passionate way he would play the game and that sometimes translated into disagreements with opposing players. Famously, Munson would feud with his catching rival on the Boston Red Sox, Carlton Fisk, after the two became tangled in a play at the plate. 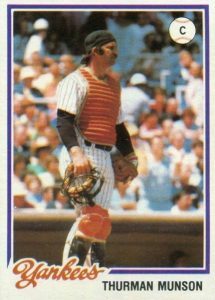 The Thurman Munson card in 1973 Topps presents him in his full catching gear, about to receive a pitch. The back highlights Munson's catching ability, especially his quick throw to second when trying to catch a runner stealing. He was an overall excellent defensive catcher and won three consecutive Gold Gloves at the position from 1973 to 1975. While premium Munson cards are limited to cuts and in-person autographs, several sets have game-used jersey and bat relic cards. One of the first examples can be found in 2001 Upper Deck Legends with square jersey pieces on a mostly white design. 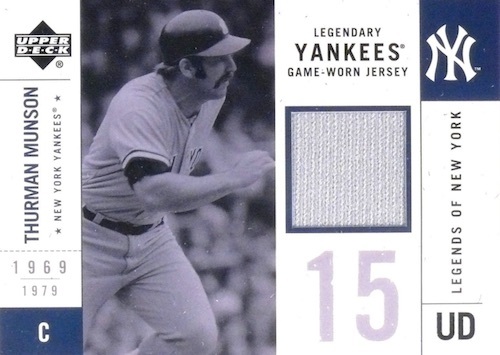 The '01 Legends set also adds bat pieces that have the Yankees logo burned into the relic, making a unique card for fans of the Bronx Bombers to collect. 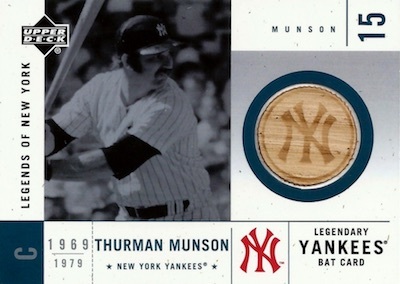 Collectors can also track down quite a few other Thurman Munson relic cards issued over the years. 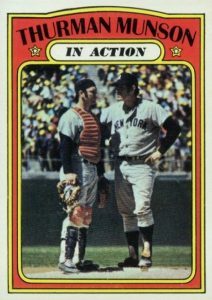 It is rare that a star player's sole rookie isn't viewed as the clear-cut favorite, but the Thurman Munson rookie card in 1970 Topps just can't compete with '71. Still, his earliest Topps card remains very popular with collectors. Munson shares his RC with Dave McDonald, a first base prospect who was traded to the Montreal Expos shortly after this card was issued. Munson was named 1970 AL Rookie of the Year thanks to his batting average of .302 with 53 RBI. 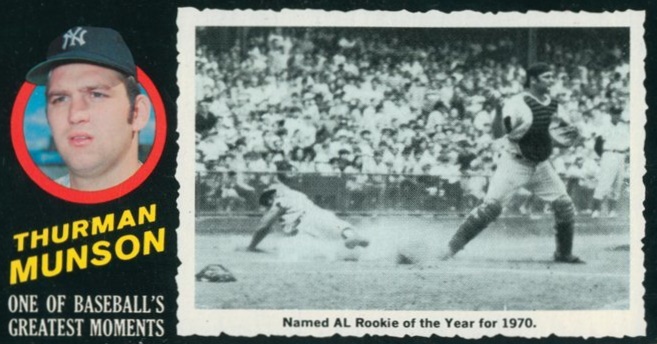 Munson's 1971 Topps offering, featuring a play at the plate with Oakland A's pitcher Chuck Dobson, was a transformational release as it showed how much action photography could improve cards. 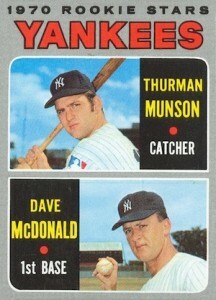 Action imagery was rarely seen in Topps sets before '71 and Munson's was the first example on the checklist. The black-border design makes high-grade examples both extremely rare and expensive. As such, even near-mint versions can easily top $2,000 at auction. For those collectors interested in picking up a Chuck Dobson card in honor of the historic card he shares, look to his rookie from 1966 Topps. 2017 National Treasures Thurman Munson 4 5! !